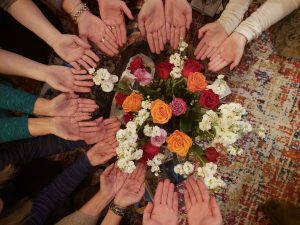 What is a Reiki class? Is it for me? What are some tools I will learn? Please check out the descriptions of each class and read some of my blogs if you are new to Reiki, or even if you are familiar yet on the fence about taking it with me. I taught my first Reiki 1 class in October 2014 to an amazing and powerful group of people in Baltimore. I learned Reiki and became a Reiki Master with my Reiki teacher, Bonnie Tarrantino and my yoga teacher Nancy McPartland as part of my 200 hour Yoga Teacher Training. I’ve been a teacher my whole career life and was a science teacher and environmental educator for 7 years. Teaching Reiki and holding a brave space for my class, bringing in the Reiki energy and attuning the class, was clearly my calling after the teaching my first Reiki class. I taught a few more Reiki classes in Baltimore before I moved to Colorado in January 2015. I then took a year to give myself and my family time to settle into and be grounded in Colorado then again started teaching Reiki in 2016 at A Moms Space in Lafayette, where I also been studied and practiced intuitive healing. Since then, I have been graduated from two years of intuitive healing training with Stacia Synnestvedt of The Meditating Mama and Wooversity.com. I graduated from the year-long intuitive development and self-healing program in April 2017 and completed the year-long intuitive graduate program in April 2018. I have embraced and brought this work into my personal growth, my private Reiki sessions, and especially my Reiki classes. I infuse all of my Reiki classes with the valuable grounding and energetic boundary tools I have learned and use daily. My signature class that focuses on setting energetic boundaries with anyone in your life, no matter where they are, even if they struggle with mental disease and/or addiction, is Set Boundaries with Compassion and Love. I am now happy to be offering Reiki classes throughout the year, usually three classes of each Reiki 1 and Reiki 2, and one Reiki 3 class- I will be teaching Masters Training in June 2019 and Karuna Reiki will be coming up also in the near future. Anyone can learn Reiki and I invite you to join me if you have even a bit of interest. I offer a monthly Reiki Share, the first Monday of the month, in the classroom of my office, to share, practice, and receive Reiki in community. I am now happy to be offering Reiki classes throughout the year, usually three classes of each Reiki 1 and Reiki 2, and two Reiki 3 classes- I will be teaching Masters Training in June 2019 and Karuna Reiki will be coming up also in the near future. Anyone can learn Reiki and I invite you to join me if you have even a bit of interest. I offer a monthly Reiki Share, the first Thursday of the month, in the classroom of my office, to share, practice, and receive Reiki in community.